50 pieces of cable ties - 2.5 x 100mm, 3.6 x 150mm & 4.8 x 230mm. 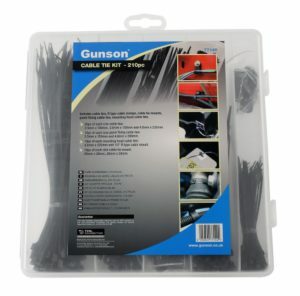 10 pieces of cable tie mounts - 20 x 20mm & 28 x 28mm. The Review Handy kit to keep in the car boot or van but we're not convinced it's worth the c. £20 price tag. Useful box to keep the cable ties in but once opened it's impossible to close again (or at least the sample box was!). Not a stocking filler for us!